TSUKUYUMI – Full Moon Down is a strategy board game which dispenses with any luck or random elements and thus particulary challenges the tactical abilities of its three to five players. 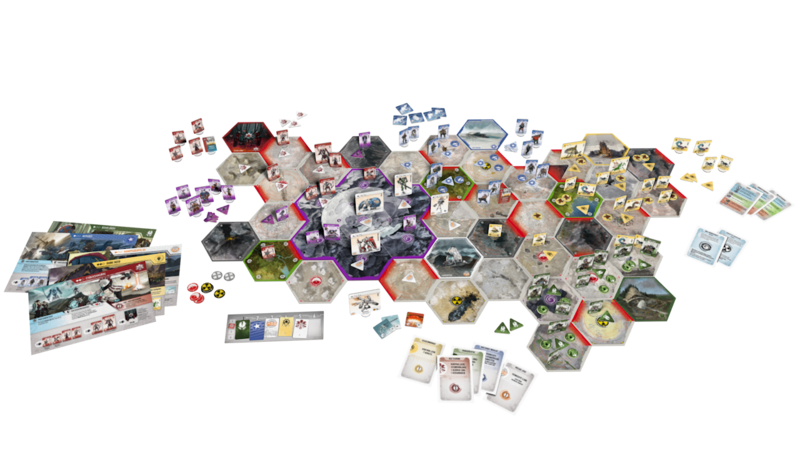 The modular board represents the barren Pacific bottom that extends around the stranded moon: Up to 40 hexagonal tiles can be arranged around the moon area. These areas can provide (additional) victory points, but also modification symbols such as the impassable sign or contamination. The aim of the game is to gain the most victory points by conquering and holding as many areas as possible and thus become the strongest force on the board. The core of TSUKUYUMI - Full Moon Down is made up of the diverse but balanced factions. At the beginning of the game, each player chooses a faction that has its own specific units and abilities. Not only your own faction choice, but also the choice of your fellow players influences your own playing style: Against which abilities do I have to be prepared? Do I have to arm myself against many agile units or against strong giants? How much space do I have on the board to spread out? The faction constellation has a major influence on the premise of the game, and the adaptation of one's own strategy is essential: What promises victory in one game is not very promising in another. As a player, you should never rely solely on the values and abilities of your faction. Each of the factions has its own unique advantages - but at the same time it must stand up to the strengths of its competitors and counter them with a sophisticated strategy. The selection of factions also influences the game itself. In addition to their specific special abilities, the factions also contribute missions and goals that have to be accomplished during the course of the game. While the completion of missions is reserved only for the faction itself, the goals can be fulfilled by all players, which earns additional victory points. Depending on the faction, there are also variations of the general rules and other ways to generate victory points: The Fireborn are a powerful dragon race, but there are only a few of them. Instead of conquering as many areas as possible, the dragons also have the possibility to attack and destroy enemy homezones, which earns them 4 victory points each. If an opponent succeeds in destroying a dragon, he will also receive one victory point as a reward. Other factions such as the Lords of the Lost Sea can generate additional victory points by using special combat cards. In addition to the opposing factions, Tsukuyumi and his henchmen must also be kept in check. If you can capture the moon and hold it until the end of the round, you will also be awarded a victory point. Depending on the requirements of the game, players find other combinations of their abilities and use them on different occasions to exploit their opponent's weakness. This means that it is always the player who determines the style of his faction and brings its values and special abilities to life on the table.